As a transformation coach, I see transition and change in everything. I love the subtle but direct messages I get from nature. Changes in the trees from one season to another, quiet ponds that turn into sheets of ice, and the occasional flock of geese, which fascinates me the most. While most days I compare myself to a strong, keen eyed eagle, there are many days I feel like a simple goose. On any given day when traveling down certain streets, I purposely slow down for the geese. I look attentively as they move in procession across the road causing the busy traffic to halt. Whether it’s early morning or sunset, the geese don’t give a ‘flock’ about how much of a hurry everyone else is in! They take their time and concentrate on getting to the destination. They are focused and steady. They don’t speed up because of the traffic or noise around them, in fact, they don’t seem to notice or care, but everything stops and waits patiently for them to get across as they move at their pace. Go at YOUR Pace – progress toward your vision and goal. Don’t concern yourself with who (outside of the flock) is in a hurry or where they are going. Focus and move with purpose. Fly – don’t go alone but with others who support you. 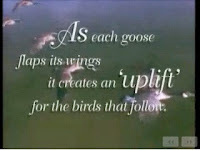 When geese fly in ‘V’ formation, they depend on the fellow geese in the flock to keep the momentum up! Stride Straight - geese often travel in a straight line – the shortest distance between two points. Zigzag movements can take more energy and time than necessary. Moving at YOUR pace is not only healthy for you, but encourages patience and respect from others. Whether leading or following in the flock, solo or with a partner or in a group, stay focused on reaching YOUR destination in health, business and/or personal development. The observers can wait patiently as you get across. Companies like Apple, Facebook, Instagram and Google all get this and that is why they are as successful as they are even in what seems to be a short amount of time. Entrepreneurship for many is a term that is often misused, many new business owners and self-employed individuals have dreams and aspirations of entrepreneurship but never fully become an entrepreneur because of lack of understanding the importance of what entrepreneurship IS, what it isn’t and what impact or contribution they truly make to the world. In studying entrepreneurship for nearly two decades and myself having started two entrepreneurial endeavors I’ve learned very early that your business isn’t the THING you do, or the product you offer. It’s not even the service you provide. Your business or your role as an entrepreneur is only in exploring one critical thing that sets entrepreneurs apart from the rest of the world that drives you to invest all of who you are into a business venture despite the lack of certainty that this new venture will actually pay off. Entrepreneurship is only an IDEA. Understanding that your business isn’t the “thing” you do but the experience you create for your customer is the first most important step in creating a business that is sustainable, innovative, and impactful. Many business owners remain stuck on services and products that don’t produce or are too fickle in their business (creating a new product every other month at the whim of a new client need only to see that not everyone has this need or they just simply aren’t buying it) and as a result have a bunch of “things” in their business instead of a clear and focused intention to not create “things” but experiences. 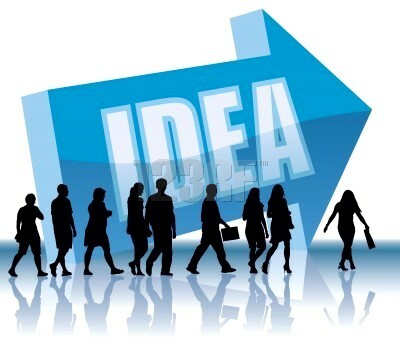 So what are 3 things you should or should NOT do in your business now to change its course? Don’t develop the “supermarket” syndrome. You know, having a business that has something for everyone but nothing for no one. Evaluate your service offerings or products in your business right now. What are you offering that people are actually buying, consistently? Focus on those core 3 things and ‘boutique” your business – It’s best to be know for 1 amazing product than 50 sub-par products. It’s not a popularity contest first. The popularity comes with being effective. Connect to your “why”. Why are you in business? I teach in my online course that one should never be a Problem solver in business but a solution provider. Is I stated in #2, you want customers for life to create this you want your customer to see you as a solution, meaning as long as they have problems to solve, they will always come to you for a solution. Even if you don’t have an immediate solution, they trust that you are able to provide it. This is how you become the Apple of your industry. Entrepreneurship has always been in the veins of our country and even world. It’s who and what many of us are. We are inventors, innovators, creators. Understanding what we are is powerful in understanding how to turn your business around, attract clients that believe in your business and vision even if it’s not fully developed. Successful businesses understand the power of evolution and realize that the only “thing” they create is a new reason to create. Allow your customers to build your business for you, not only is it liberating, but it’s sustainable and profitable.